This first tab, Search + Replace, searches through the chosen metadata field looking for a word or phrase, and then replaces all its occurrences with alternative text. So for instance, you may have some pictures with a variety of captions like “Close-up of columns at Paestum”, “Frontal view of columns at the Capitol, Washington DC”, “Columns at the Parthenon, Athens” and so on. Imagine some of them have the misspelling “columm” – how do you correct that? Normally, this could take some time as you would have to select each group of pictures and change that group's caption before moving onto the next set. 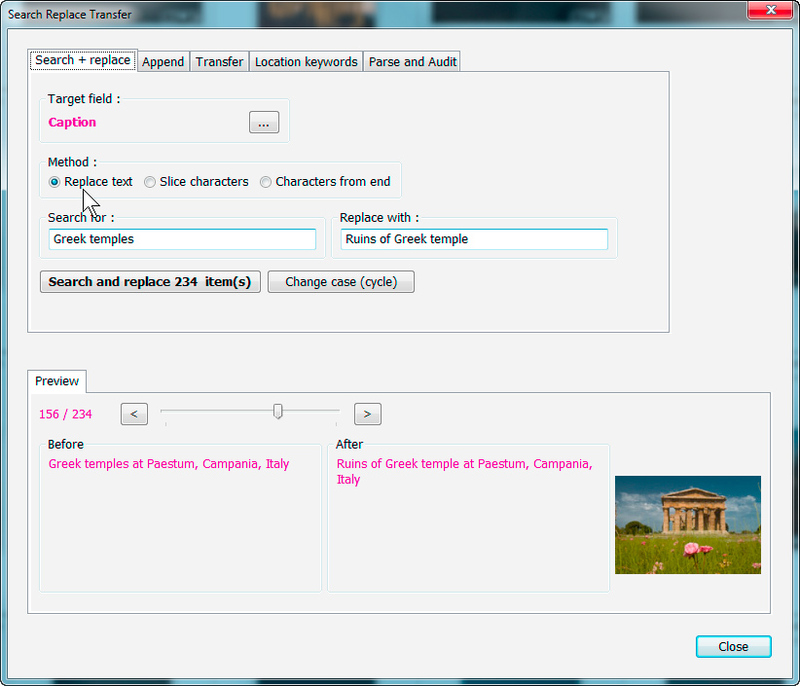 Alternatively, how would you insert the word “Doric” before columns in all these images? Again, it can take lots of time if the captions are all different. To change the field which will be searched, just click the “...” button. To preview the results, move the slider. When you're ready, click the "Search and replace x items" button.